Shepherd's Pie, made with leftover pork, Thyme for Cooking easy dinner. Made with leftover pork instead of the traditional ground lamb, it's still an easy, delicious, warm and comforting winter meal. Chop onion, garlic, celery and carrots. Cut pork into bite-size pieces. Heat oil in large nonstick skillet over medium heat. Add vegetables and sauté 6 - 8 minutes, until they start to get tender. Add pork, sauce, chicken stock, mustard and thyme. Mix well and bring to a simmer. Dissolve cornstarch in water and stir into pan to thicken sauce. Spoon the pork mixture into a baking dish just large enough to hold it, plus the potatoes. 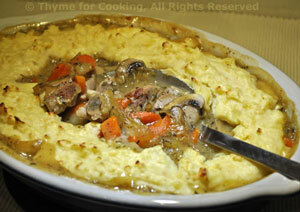 In medium bowl lightly mash the potatoes, adding a bit of milk if needed to soften. Spoon potatoes over meat - covering as best you can. Bake at 400F (200C) until heated through - about 15 minutes. Serve.